Join us this year as we honor and memorialize the special people in our lives in one of two ways. You may give an Easter Lily, which will be used to decorate the chancel for Easter, or you may make a contribution to the Inter-Faith Council for Social Services, which will be used to provide support to those in our community who are in need. You may choose to do both! The names of those we honor or remember will appear in the Easter Sunday Worship Bulletin, April 21, 2019. 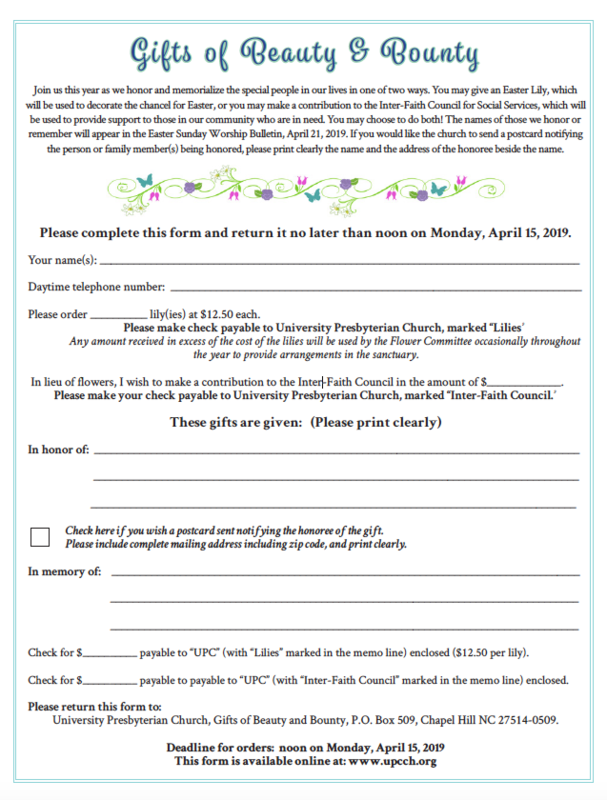 Click here to view and print an order form. Forms must be received by noon on Monday, April 15. Contact Jeanette (919.929.2102) with any questions.